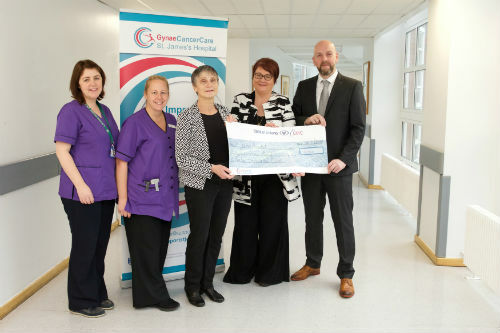 Susan Carry, patient at St James’s Hospital, worked alongside her employers and colleagues to fundraise for Gynae Cancer Care Lymphoedema Appeal. Susan tells her story here and how they did the fundraising. ‘I was diagnosed with cervical cancer at the end of 2006. I had a complete hysterectomy with lymph node removal, followed by chemotherapy and radiotherapy. Shortly after the end of the treatment I noticed a swelling in my feet but really didn’t connect it to my cancer problems. After my first bout of cellulitis, a skin infection that is common with lymphoedema, the swelling spread through both legs from hip to toe and I was told I had lymphoedema. There is no cure for lymphoedema but it can be maintained with regular lymphatic drainage massage, bandaging and wearing compression garments. I have great admiration for Dr Noreen Gleeson and her team who treated me in 2006 and when my cancer returned in 2013. Noreen was always frustrated that there was very little comprehensive lymphoedema care available and had great empathy for me as a patient suffering from this condition. So when she told me about the surgical equipment, she was hoping to get funding for, I had to help out. 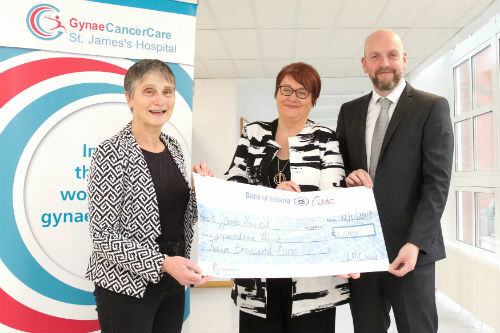 A huge thank you to Susan Carry, her colleagues, sponsors and especially to LMC Group www.lmcgroup.ie for supporting and then matching the fundraising efforts, rounding off the donation to a fantastic €12,000. Dr Noreen Gleeson, Susan Carry and Stephen McConnell of LMC group. Elaine Gray, Ciara Donohoe, Dr Noreen Gleeson, Susan Carry and Stephen McConnell of LMC group.